To my mind, the difficulty which NBN Co appears to be facing with respect to the wireless component of its rollout is symptomatic of the problems which a new network infrastructure owner and builder faces when deploying this kind of infrastructure, compared with an existing company. It’s well-known that Telstra was able to push Swedish vendor Ericsson, which is constructing NBN Co’s wireless network, very hard to get most of its initial build of its Next G 3G network completed in just one year in 2006. 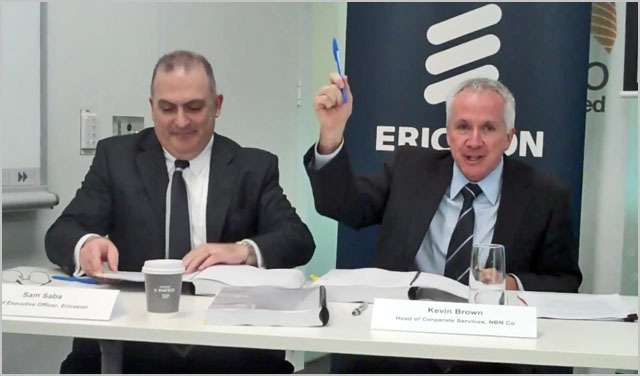 In contrast, NBN Co has already had several years since it contracted Ericsson for the wireless rollout in June 2011 (above you can see a picture of then-Ericsson Australia managing director Sam Saba and NBN Co executive Kevin Brown signing that contract), and it’s still struggling to get the project off the ground. The wireless component of the NBN is supposed to be finished in 2015. One suspects that it won’t quite get there. Wireless not the NBN killer after all? You can, however, blame all the NIMBYs protesting the locations of towers, and forcing legal action to be taken, and rulings to be made which take time. Dereel in Victoria is the perfect example of a tower that was supposed to be ready over a year ago, and has been held up – (predominantly) – by the actions of a single woman. You could also blame Ericsson. You could also blame NBN Co.
Let’s go a bit easy on the whole “bloody NIMBYism” bit. If someone (anyone) wanted to put up a stinking great aerial in close proximity to the property of anybody who reads this site I’m sure we would all object. Surely NBN would have factored community objections into their forecasts? To not have done this shows poor planning. It was always going to happen (and should happen in a democracy). Would you rather live in China and have no say what so ever? But remember, many of the NBN FttP detractors (including AJ and MT) have at times used the old wireless is the future, as part of their NBN derision. Imagine had they actually meant it (not just been playing politics) abandoning fixed entirely and planning complete wireless? Also wireless forms a big part of the alternate NBN plan too…so! Not really, there are so many “stinking great aerials” in close proximity to my house that a few more really are not going to matter. Then again I live in the city, land is expensive, views are poor, people mostly work all day, but you generally get access to good infrastructure. People who live in the country have a different set of priorities and a different set of trade-offs and that’s a good thing — people are not all the same, nor should they be. Seriously through, a little disapointing, but considering this affects a minority of the population and will still probably be finished ahead of everything else it isn’t that much of a big deal. That won’t stop it being used as dirt in the upcoming election right? Any indication on the source of the delay? I know one of the issues facing Telstra competitors in expanding mobile coverage is obstruction by councils for new tower work where they consider what they have is already “good enough”. There has been plenty of evidence for these types of delays in the press. Having said that NBN should be able progress rather rapidly to completed build on these issues are worked. Overall it looks like the number cause of delays in the NBN project is timelines associated with approval for external entities. It would seem they’ve selected the wrong spectrum for their wireless component then if tall trees are a problem. Most rural areas tend to have a few tall trees, particularly in our area Between Forster & Taree NSW. Guess we’ll have to live with our existing crappy 1Gb/s ADSL1 for the foreseeable future. Sorry to get your hopes up, must have had a senior moment. I should have said a 1.5Mbps connection which results in a whole 0.13 MB/s ( 132 KB/s) best effort in dry weather. It’s would be interesting to hear what NBNCo is doing to address this. Like how they hired their own workers in the NT to fix the Syntheo stuff up. Would you be able to get a comment from someone at NBNCo Renai? You guys (and the blogger) have no bloddy idea what you talking about do you ? As the blogger kindly pointed out, Telstra’s problems have been because of the local council (permits etc.). How do you expect it to be any different from the NBN ? It is actually worse for NBN as any single country man shouting foul on the proposed wireless tower location get front page news every single time. I read one about a farmer concerned about her fruits getting radiated and decided to shout out to the council, who then “investigates” (read: delay) the tower built. I laughed so hard that I cried. Some people here pointed out as well that NBN rolled at the wrong frequency. What bloody frequency would you suggest ? 700 MHz ? then the NBN will only be STARTING at 2015 instead of FINISHING, after they cleared the spectrum from the analog TV channels. it makes me wonder if Ericson has subcontracted the work out to another company.